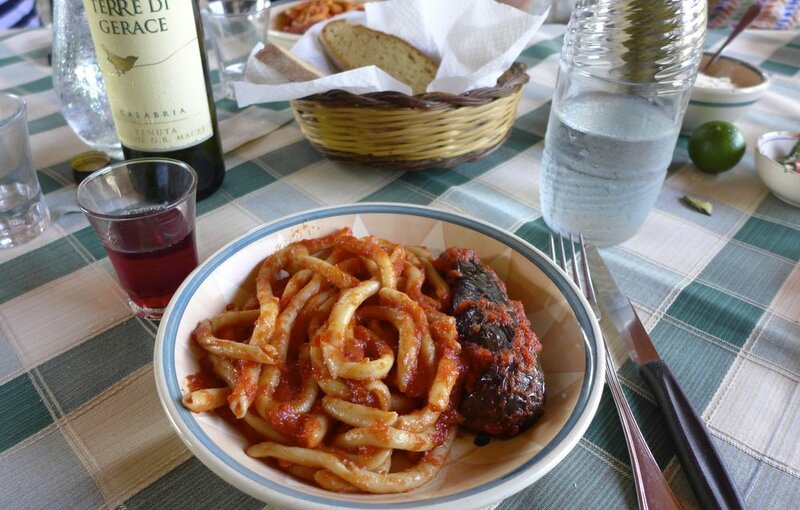 Escape to Calabria for a 7 day culinary adventure to experience the art of food pleasure. Relax in the countryside, visit ancient villages, savour delicious foods and learn how to recreate classic Italian dishes from local masters. This holiday is for anyone that would like to escape their busy lives and reconnect with nature through food. EARLY BOOKING SPECIAL: Book by May 1st and save $250 per person! Do you love Italian food and culture? Would you like to experience the Italian art of food pleasure? Do you want to escape your busy life and reconnect with food in its purest form? Then join Discover Calabria & City Saucery on an Italian Culinary Adventure and let us indulge your senses. Your accommodations will be at a beautiful organic farm that specializes in olive oil, wine, citrus fruits and dairy products. Enjoy farm to table meals and learn how to recreate classic Italian dishes. 1 x preserves workshop. Learn the tricks of canning, infusing and bottling Italian preserves. The Jasmine Coast is a region of Calabria which runs along the Ionian Sea between the cities of Riace and Locri and gets its name from the fragrant Jasmine plant that grows wild in the area. This area is rustic and untouched and is famous for its surrounding views of the mountains and the sea. If you are looking for an authentic location in Italy where time stands still then look no further. The culinary traditions of Calabria are steeped in centuries of history. Many of the recipes and ingredients used in the cuisine have been brought over from the nations that have invaded and conquered Calabria since the beginning of history. The Greeks, Romans, Byzantine, Saracens, Normans and Arab just to name a few. All these cultures have gifted Calabria with their unique ingredients and recipes, and what remains today is an eclectic blend of flavours influenced by these cultures. Fresh pasta made by hand, natural breads, sun ripened fruits and freshly picked vegetables, meat from farm raised animals, fresh cheese, organic olive oils and local wines from ancient soil, here you will experience food pleasure in its finest form. This organic farm specialises in developing natural olive oil, wine, olives, bread and products made from citrus fruits, 100% derived from organic farming, following traditional processing methods. We want to help you connect with food and nature and Calabria is the place to do this. This culinary experience has been inspired by the Slow Food Philosophy which believes in bringing consumers back to the source of where food comes from. Fortunately Slow Food is a way of life in Calabria, it's a place where people put love and passion into their meals and have a deep connection with food and nature. A place where ancient traditions and recipes have been passed down and still exist today. Click here to learn more about the Slow Food Philosophy. You will be flying into the Lamezia Terme Airport the airport code when booking is SUF. You can find flights directly to Lamezia via Alitalia or Ryanair. Alternatively you can book a flight into Rome then book a connecting flight directly to Lamezia. Please let us know what time you will be arriving and we will have a driver waiting for you at the airport.